It surprises me that a focus on nutrition for children isn't more mainstream than it is. The CDC issues scary warnings like "that the number of Americans with diabetes will range from 1 in 3 to 1 in 5 by 2050." Major scientific journals question "the relationship between dietary fat content and the prevalence of obesity," bringing up "the so-called fat paradox" that obesity is on the rise in spite of people eating more low-fat products and less fat, and speculating whether refined carbohydrate foods are actually the culprit behind weight gain. We're even seeing books by science writers pointing at rigorous studies showing that the most consistent risk factor for developing heart disease, as far as diet is concerned, is the intake of carbohydrates. And the first lady tries to improve health among children with her Let's Move initiative. 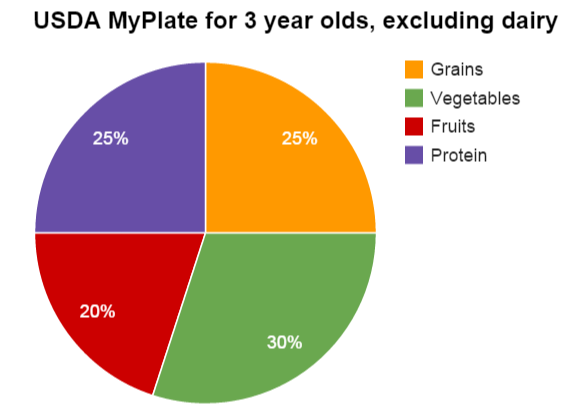 Meanwhile, my sons' Learning Links day care center falls far from meeting the USDA's nutritional guidelines for young children, erring far on the side of filling the kids' diet with carbs in place of vegetables and proteins. In spite of devoted teachers and a generally great environment, nutrition somehow hasn't made the top of the priority list for either operators nor the owners. 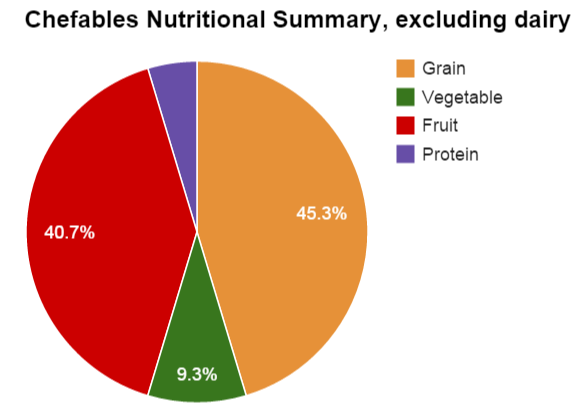 Analysis of Chefables snacks served at Learning Links in Mountain View for the month of June 2014. The day care is owned by the City of Mountain View, who contracted first with CCLC and since Feb 2014 with Community Gatepath to operate the day care. (Learning Links is the name of the day care, while Community Gatepath is the mother organization.) CCLC's regional director clearly told me that Chefables, the snack vendor, is very convenient and she wasn't interested in changing a convenientÂ relationship for the sake of improving nutrition. The Community Gatepath/Learning Links staff has been more open, explicitly acknowledging an interest in improving the nutritional content of the children's two daily snacks but without a significant impact over their first 10 months of operation in Mountain View. Three times now I've been told that Learning Links is asking Chefables for a change to the menu; we'll see what the New Year brings, but the first two menu changes suggested a lack of initiative more than a concerted effort. My kids eat breakfast and dinner at home; a home-made lunch at school; and two Chefables snacks daily. For some children at the center, the morning snack is breakfast. So the day care provides 2 of my kids' 5 meals, and 2 of 4 of some kids' meals. It bothers me that the lesson all these kids are learning is that a cookie, pastry or bread constitutes half the menu in half of their meals. Given that our day care is in Silicon Valley, one of the wealthiest and best educated parts of the country, I wonder what goes on in less fortunate parts of the country or at less expensive day cares. I wonder how this bodes for our children's and our society's future. It's a little scary, truth be told.